After a tease last December, horror game Outlast has jumped-scared its way onto Nintendo Switch today. "We thought it would be fitting, considering the style of our game," says Red Barrels Games president Philippe Morin regarding the sudden arrival. "The reception so far is great, and we're very excited." Outlast made a name for itself back in 2013 when it turned streamers into screamers and caused minor cardiac arrests amongst the PC gaming community. 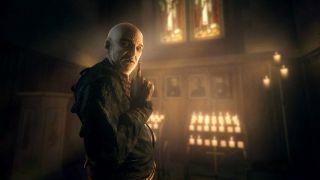 Set in Mount Massive Asylum, players stepped into the shoes of journalist Miles Upshur as he investigates creepy experiments happening at the facility. Horror fans won't be surprised to learn that those 'experiments' aren't based around aromatherapy and yoga. Morin promises the experience hasn't been diluted by its jump to the Switch. "Players can expect the same level of tension, overwhelming feelings of dread, and chilling storytelling the other platforms offered, except this time on the go," he says. "I think the idea that you can play horror games in the setting or location of your choice is freeing for players. They can either decide to crank it up a notch and make it scarier by playing under their covers, or play in broad daylight in a coffee shop to tone it down a bit." The game's truly terrifying follow up, Outlast 2, is on its way to Switch on March 27, and you can pre-order it now.